This month with Mother Goose Time we got geoboards and boy was I excited. I remember playing with geoboards for hours as a child. Geoboards are a fun and exciting way to teach kids basic math and even literacy skills. They create a physical connection to the topic you are teaching. Having fun and learning go hand in hand. Storage. You will need a box or container for your geoboards to keep them and all of the rubber bands from coming up missing. Get double sided geoboards so you can have even more fun. We like ones that over a circle on one side giving you the chance to explore circles and even pie charts with the geoboard. Buy LOTS of rubber bands. Rubber bands come up missing and break all the time so a nice big stock will come in handy. Multi color rubber bands are best for creative fun and extra learning options. Before we get into using geoboards for math I want to talk about a way you may not have though to use them. Teaching your preschooler how letters are formed. This is a great way to work on letters with your reluctant writer. Placing the rubber bands helps work fine motor skills. These are such a great tool for preschool children. Before we move on to big kids lets talk about the titles a bit more. Geo boards are a great way for children to learn how to see and understand shapes. Help your child create a shape. Discus what shape they have made and what characteristics make it that shape and not another. This helps them get hands on with shapes and learn what makes each one unique. If you get a double sided board you can use your geoboard to teach your child how to tell time. Place a band completely around the perimeter of the circle. Use two different colored bands for the big and small hands. Practice telling time as you move the hands around the circle. Have your child help move each hand and tell you the new time. a Geoboard is a great tool for helping your child understand what the perimeter of a shape is. Have your child place the rubber band then count pegs along the edges of the shape they created. Talk about how this is the perimeter of the shape. Now use a ruler to measure each edge of the shape. When you use a geoboard to teach perimeter you can also teach area. Discus how many blocks and pegs are inside the shape your child has made. Count each peg in the shape than challenge them to create as many shapes as they can with the same number of pegs in the center not on the edges. They have created shapes that take up the same area as the first shape. You can use geoboards to practice addition and subtraction by using a rubber band to mark off a particular number of squares, Then another rubber band to mark off a 2nd set of squares. Then add them together. You can do the same thing by have your child mark off a number of squares in one color then use another color to mark of squares inside that shape to subtract. 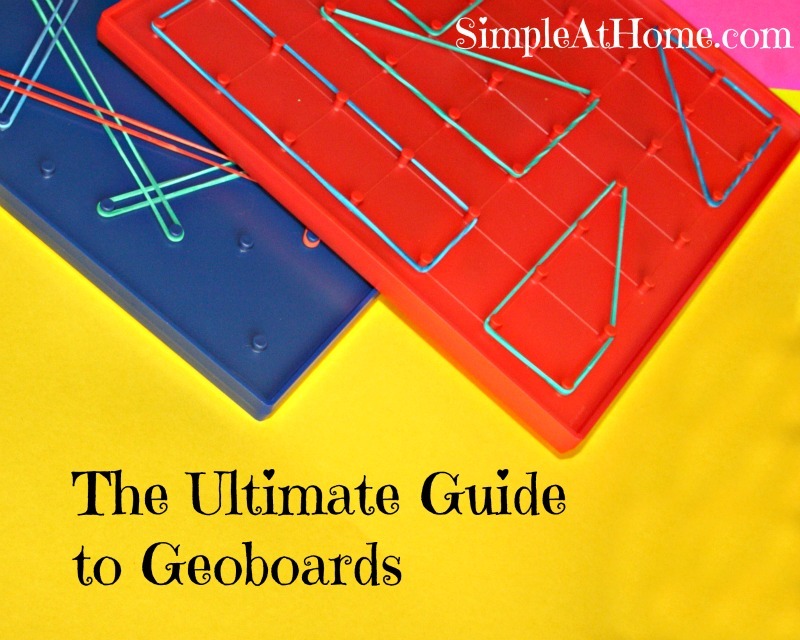 Looking for a great geoboard for your preschooler? Our geoboards are part of Mother Goose Times preschool curriculum and custom made. The 8in x 8in size and 6 squares x 6 squares set these geoboards apart from others. the large squares are perfect for little hands. While these ideas work or smaller and larger boards if you want your own set like ours you have to act fast and get the Food and Fitness theme from Mother Goose Time before they run out.